This enterprising and thriving town is located partly on the land claim of Mr. John Barger, and partly on that of Mr. Brown, and is divided into two parts by that beautiful mountain stream appropriately named Silver Creek. The land in the vicinity is exceedingly fertile, and the surrounding scenery pIcturesquely beautiful; a general air of prosperity seems to pervade the place. The creek offers fine facilities for water power, which is partly utilized by the flouring mills erected by Messrs. Coolidge & McClaine at a cost of about $15,000. The capacity of the mill is about one hundred barrels per day. The mill is now owned by Cooper & Co. The neighborhood of Silverton bids fair to excel in the matter of fruit culture. There are many fine orchards, the pro­ducts of which find a ready sale. There are commodious hotels in the place. The Free Masons, Odd Fellows, and Grangers have lodges here. The convenient location of this charming little town, and the peculiar character of the adjoining topography, forcing, as It, does, the channels of trade from the surrounding country in directions which converge at the point, would seem to insure it a future of permanent prosperity, which the enterprise of its citizens has labored strenuously to secure. There is a daily stage running between this place and Salem, carrying the mails. 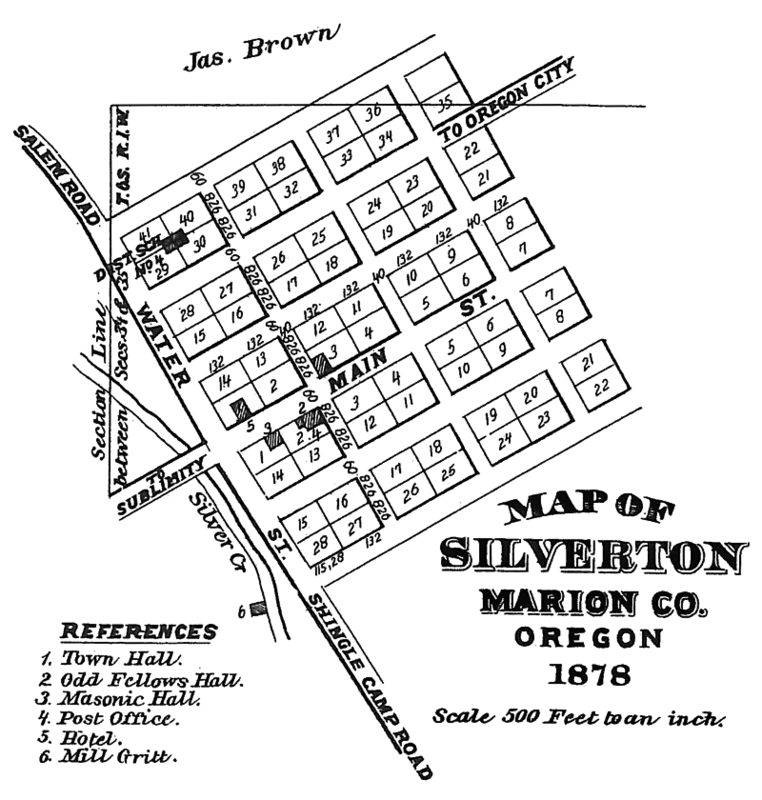 From the Illustrated Historical Atlas Map of Marion and Linn Counties, Oregon. By Edgar Williams & Co. 1878.